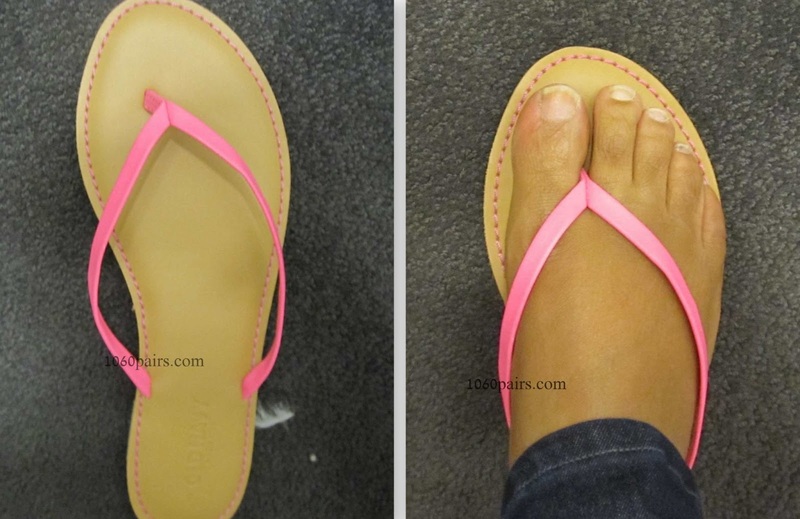 Old Navy faux leather capri sandals ($12.94) – The top color is natural. The bottom colors is flamingo flamingo top. I thought about getting red and navy, but I’m in a pink mode right now so I figured plain and pink would be best. The pink are $8 online. All colors in this sandals were $8 yesterday. There’s a 30% off storewide promo as of today, 5/31 & tomorrow, 6/1. No coupon needed, fyi. They might put them back at full price given the promo. There’s also a capri with a striped sole. After having a little bit of foot pain at the end of on summer, I realized flip flops were an issue. I still want to wear them, so I tried upgrading to leather. That worked out for a couple pairs from Talbots that lasted multiple seasons. I didn’t have the same experience w/a capri style in leather from Gap. They started ripped at the sole. I think if I used blister block on the bottom of my feet, they would slide and that would help. However, overall I wasn’t impressed with the wear. 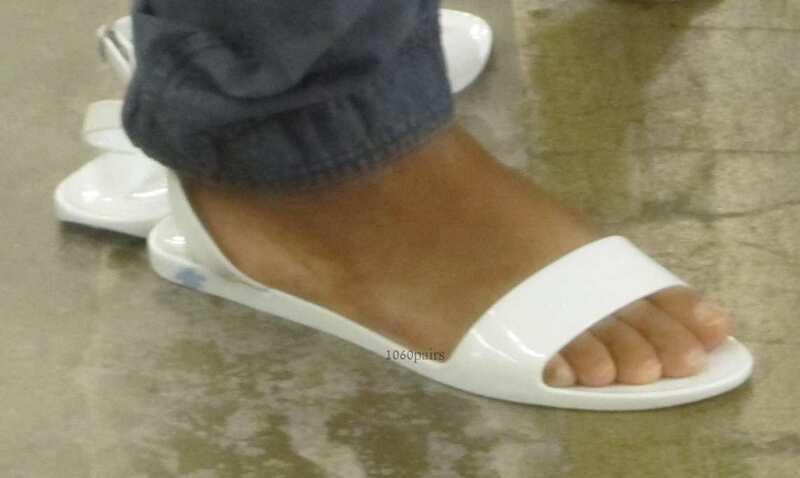 These capri sandals at Old Navy are padded and very comfortable. None of the shoe is leather, but if they last one season I’ll be very happy and at a lower price than leather. Did you hear me? They’re padded. Embellished capri sandals ($19.94) – I got these, too. They were $12 in-store vs $17.50 on promo online. They’re also padded. The embellishment is 2 rows of sequins. They’re not the most sparkly I’ve ever seen, but the sandals are still cute. Padded. Embellished flip flops – This color looks fun. I didn’t see these irl, so I’m not sure if the faux stone looks bad or looks pretty good. They’re cheap sandals, but I don’t want them to look like I glued the stone on. Otherwise I will really (consider) do(ing) it myself and pick a better stone. Jelly sandal ($12.94) – The two stores I visited didn’t have these. I didn’t order them because they don’t look padded. Plus I’m not a big fan of ankle straps. I like jelly sandals, though, and these have good ratings online. The store product search feature said none in my local store, but there they were…hanging on a rack. Size 8 – Black. I thought these would melt into my feet if they saw the sun. After all, they are plastic. A pass for me based on color. The strap felt a little tight, but I have ankle claustrophobia issues. Minor ones. I don’t like the feeling that my ankles might be choking. Just some plastic shoes. I wear 7.5 and took 8. they’re a little long on either end, but I think this is the right size. Size 8 – I like the white. Nice contrast w/my skin tone. I thought these were pretty cute for a net $7. However, I would have concerns about tripping in them. Maybe that’s because they’re just a little too big in the length. I’m also doubtful of long range comfort and would probably wear these if I didn’t expect to do a lot of walking for the day. All those drawbakcks, but I still think they’re fun. Bow-tie jelly sandal for baby ($12.94) – Mini G might need these. Cute! Thanks for your whole efforts on this website. Debby really loves participating in internet research and it is simple to grasp why. We all know all of the lively mode you deliver invaluable tips and tricks through this web site and in addition boost participation from others on this concept plus my princess is undoubtedly studying a great deal. Take advantage of the rest of the new year. You are always performing a first class job. I was very pleased to locate this web-site. I wanted to thanks for your time for this fantastic read!! I surely enjoying each and every little bit of it and I’ve you bookmarked to check out new stuff you blog post. Hi there, simply become alert to your blog via Google, and located that it’s truly informative. I am going to be careful for brussels. I’ll be grateful should you proceed this in future. A lot of people shall be benefited from your writing. Cheers! Heya superb website! Does running a blog similar to this require a great deal of work? I have virtually no understanding of coding however I was hoping to start my own blog in the near future. Anyway, should you have any ideas or tips for new blog owners please share. I know this is off subject however I simply wanted to ask. Kudos! obviously like your website however you have to check the spelling on several of your posts. A number of them are rife with spelling problems and I in finding it very bothersome to tell the reality however I will definitely come again again. I truly wanted to write a quick note to be able to thank you for some of the marvelous advice you are sharing at this site. My prolonged internet search has at the end of the day been recognized with reliable facts to exchange with my best friends. I would state that that many of us readers actually are very much blessed to exist in a superb place with so many perfect people with interesting hints. I feel very much blessed to have discovered your webpages and look forward to some more awesome minutes reading here. Thanks again for all the details. I simply want to tell you that I am just newbie to blogs and absolutely loved this web page. Most likely I’m planning to bookmark your website . You certainly have outstanding well written articles. Cheers for sharing your blog. I just want to tell you that I’m beginner to weblog and absolutely savored you’re web page. Probably I’m going to bookmark your blog . You surely come with incredible well written articles. Many thanks for sharing with us your web site. I simply want to mention I am just all new to weblog and certainly liked you’re website. Very likely I’m want to bookmark your website . You certainly come with exceptional writings. Thanks a bunch for revealing your blog site. I simply want to say I’m new to blogging and actually liked your web site. Almost certainly I’m likely to bookmark your blog . You amazingly have incredible writings. With thanks for revealing your website. I just want to say I am very new to weblog and definitely loved this web blog. Likely I’m going to bookmark your blog post . You amazingly have perfect articles and reviews. Thanks a bunch for revealing your webpage. I just want to mention I am just newbie to blogs and honestly loved this web site. Probably I’m likely to bookmark your website . You amazingly come with impressive stories. Cheers for sharing your website page. I simply want to tell you that I am beginner to blogging and definitely savored you’re web blog. Likely I’m want to bookmark your blog . You amazingly come with awesome stories. Thanks for sharing with us your web site. I just want to mention I am just newbie to blogging and certainly loved you’re web page. Very likely I’m want to bookmark your blog post . You really have tremendous articles and reviews. Many thanks for sharing your web-site. I just want to say I am just newbie to blogs and definitely enjoyed you’re web site. Probably I’m going to bookmark your website . You surely come with wonderful article content. Regards for sharing your blog. I simply want to mention I’m all new to blogging and honestly loved your blog. Almost certainly I’m likely to bookmark your blog post . You certainly come with awesome articles. Thanks a lot for sharing your website. I simply want to tell you that I am very new to blogging and absolutely loved your blog. More than likely I’m going to bookmark your site . You really come with exceptional well written articles. Regards for sharing with us your web site. Youre so cool! I dont suppose Ive learn something like this before. So good to find anyone with some unique ideas on this subject. realy thank you for starting this up. this website is one thing that’s wanted on the web, somebody with a little bit originality. helpful job for bringing one thing new to the internet! I was just searching for this info for a while. After 6 hours of continuous Googleing, finally I got it in your web site. I wonder what is the lack of Google strategy that don’t rank this type of informative websites in top of the list. Usually the top web sites are full of garbage. hey there and thank you for your information – I’ve definitely picked up anything new from right here. I did however expertise some technical points using this site, as I experienced to reload the site lots of times previous to I could get it to load properly. I had been wondering if your hosting is OK? Not that I’m complaining, but sluggish loading instances times will very frequently affect your placement in google and can damage your high-quality score if ads and marketing with Adwords. Anyway I am adding this RSS to my email and could look out for a lot more of your respective interesting content. Make sure you update this again soon.. Some genuinely nice and useful info on this website, also I conceive the design and style holds excellent features. Oh my goodness! Awesome article dude! Thanks, However I am going through troubles with your RSS. I don’t know the reason why I cannot join it. Is there anybody else having identical RSS problems? Anybody who knows the solution can you kindly respond? Thanx!! naturally like your web-site however you have to test the spelling on several of your posts. Several of them are rife with spelling problems and I to find it very troublesome to inform the truth however I will definitely come again again. Great post. I was checking continuously this weblog and I’m inspired! Very helpful information specifically the last phase 🙂 I deal with such information a lot. I used to be looking for this particular information for a long time. Thanks and best of luck. I have been exploring for a bit for any high-quality articles or blog posts on this kind of house . Exploring in Yahoo I ultimately stumbled upon this website. Reading this information So i am glad to convey that I’ve a very good uncanny feeling I came upon exactly what I needed. I such a lot no doubt will make sure to do not overlook this web site and provides it a glance regularly. Thanks a lot for sharing this with all people you really recognize what you’re talking about! Bookmarked. Kindly additionally visit my site =). We may have a link exchange agreement among us!